In this Photoshop Effects tutorial, we're going to learn how to colorize a photo using multiple colors. It's an effect I've seen used quite a bit in ads for photo printers and for color calibration software. The idea is simple. Take a single photo, divide it into multiple sections of equal size (usually four sections), then colorize each section using a different color, or a different shade of the same color, to create interesting results. With the photo printer ads, for example, each section of the photo is usually colorized using one of the four main colors of ink (cyan, magenta, yellow, and black). With the color calibration software ads, each section of the photo is tinted with a slightly different color to show how the same image can look different on different monitors when they're not properly calibrated. These are just two common examples of how this photo effect can be used, but you can colorize your image with whatever colors you like depending on the subject of your image and the mood or message you're trying to convey. Use reds, oranges and yellows to colorize an image of kids playing in the leaves in the Fall, or different shades of blue to colorize a cold, wintry landscape photo. Or colorize three of the four sections with the same color and use a different color to highlight one specific section of the photo. For such a simple effect, there's lots of different ways you can use it. Photoshop makes creating this effect incredibly easy. First, we'll divide our photo into four sections using guides, then we'll use several Hue/Saturation adjustment layers, as well as their layer masks, to colorize each section with a different color. When we're done with the initial effect, we'll see how we can use an additional Hue/Saturation adjustment layer to quickly change all four colors at once! Here's how the image will look when we're done. Keep in mind that you don't need to use the same colors I'll be using. This tutorial simply shows you how to create the effect. The actual colors you use are completely up to you. As I mentioned, at the end of the tutorial, we'll see how we can quickly change all four colors at once for different results. Select Vertical for the Orientation and enter 25% for the Position value in the New Guide dialog box. The first guide has been added to the photo. Set the Position of the second guide to 50%. The second guide has been added to the photo. Set the Position of the third guide to 75%. The third guide has been added to the photo. Thanks to the three guides we've added, one at 25%, one at 50%, and one at 75% of the way across the image, our photo is now divided up into four sections of equal size. We can now begin colorizing each section, which we'll do next! Make sure the Snap To Guides option is turned on. A checkmark means the option is enabled. The first section on the left is now selected. 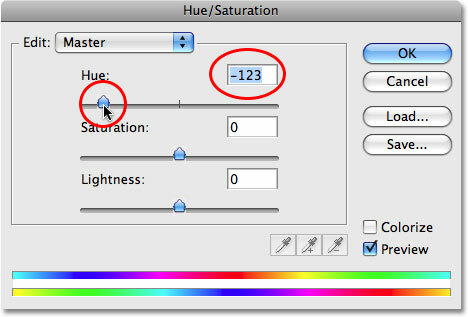 Select A Hue/Saturation adjustment layer from the bottom of the Layers palette. 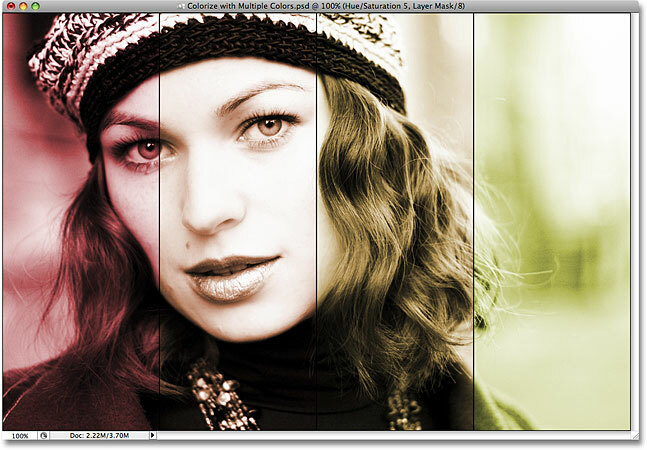 The layer mask preview thumbnail in the Layers palette. That's because we added the adjustment layer while we had a selection active in the document. Photoshop used the selection to alter the adjustment layer's mask. The white section on the left is the area we selected in our image, and the white means that whatever we do with our Hue/Saturation adjustment layer will be visible in that section of the image. The rest of the layer mask is black, which means that the rest of the image will not be affected by anything we do with our adjustment layer. This is what's going to allow us to colorize each section independently of the others. If you want to learn more about how layer masks work, be sure to check out our full Understanding Layer Masks tutorial in the Photoshop Basics section of the website. Select the Colorize option in the dialog box. Drag the Hue slider left or right to change the color. The first section of the photo is now colorized. Step 10: Change The Blend Mode Of The Adjustment Layer To "Color"
With the adjustment layer set to the Color blend mode, only the color in the image will be affected. One section down, three to go! Drag a selection around the second section. 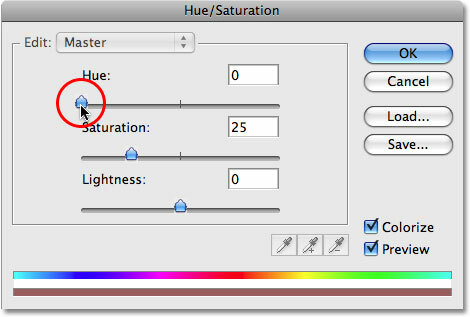 Click on the New Adjustment Layer icon and choose Hue/Saturation. Our second section in the photo appears white in the layer mask preview thumbnail. 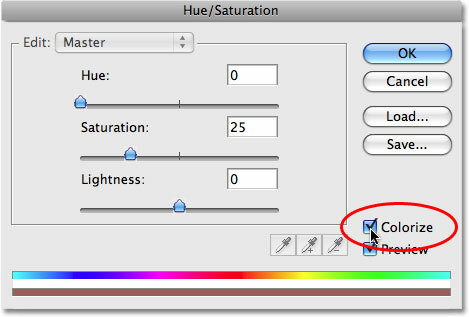 Select the Colorize option, then drag the Hue slider to select a second color. The second section of the photo is now colorized. Step 14: Change The Blend Mode Of The Adjustment Layer To "Color"
We now have two of our sections colorized. To colorize the remaining two sections, simply repeat Steps 11-14 for each section. First, drag a selection around the section using the Rectangular Marquee Tool, then click on the New Adjustment Layer icon at the bottom of the Layers palette and select Hue/Saturation from the list. 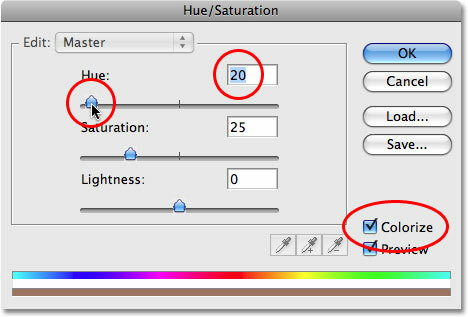 When the Hue/Saturation dialog box appears, select the Colorize option in the bottom right corner, then drag the Hue slider either left or right to select a color for the section. Click OK when you're done to exit out of the dialog box. 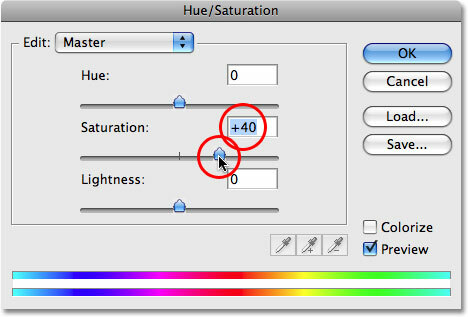 Finally, change the blend mode of the Hue/Saturation adjustment layer to Color. Each of the four sections now has its own Hue/Saturation adjustment layer in the Layers palette. All four sections of the photo are now colorized. If you find, as I do, that the colors in your image are looking a little dull, don't worry. We'll see how to fix that at the end of the tutorial. Go to View > Clear Guides to remove the guides from the document. The guides have been cleared from the image. Let's add a stroke around each of the four sections to make them more distinguishable from each other. We'll do that next, and then we'll see how to quickly change all four colors at once! Change the Stroke options circled in red. The section on the far right now has a black stroke around it. Select all three remaining adjustment layers at once. All four sections now have a black stroke applied to them. And with that, our main photo effect is complete! Let's finish things off by looking at an easy way to change all four colors at once, as well as how to brighten up the colors if needed. We'll do that next! Add a fifth adjustment layer above the others. Dragging the Hue slider to the left. Make sure the Colorize option is not selected this time. Dragging the Hue slider has shifted the colors in the effect. Dragging the Hue slider to the right. The colors in the effect have changed to greens and blues after dragging the Hue slider to the right. The image with the original colors. 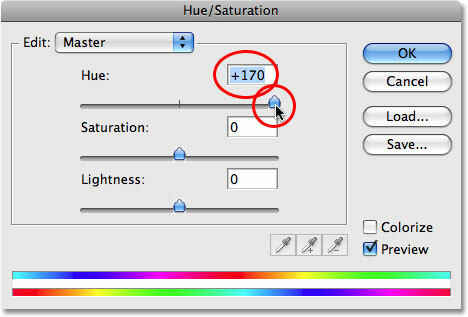 Drag the Saturation slider left or right to increase or decrease color saturation, which changes the intensity of the colors. The image after increasing color saturation. And there we have it! That's how to colorize an image with multiple colors in Photoshop! Visit our Photo Effects section for more Photoshop effects tutorials!